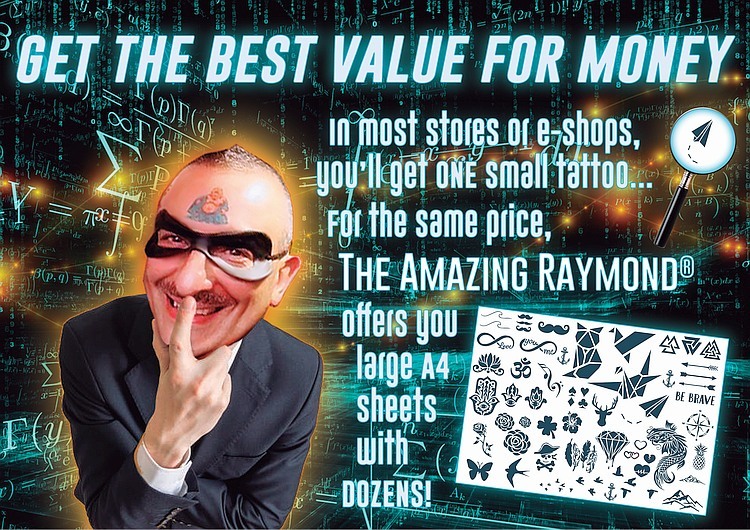 Following the lastest trends in the tattoo world, The Amazing Raymond® provides a wide range of stunning body art covering a variety of themes. 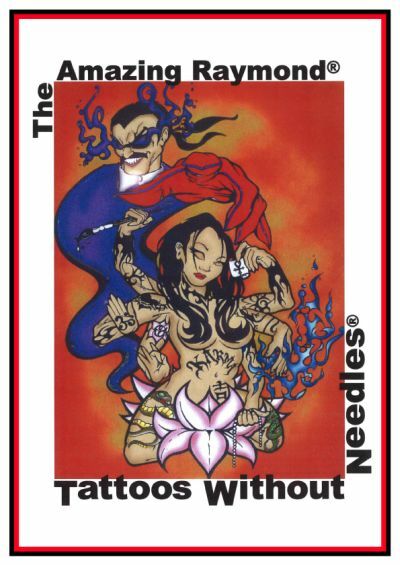 Vintage Rockabilly, Gangsta, Asian, Bloke and Celebrity Inspired temporary tattoos are some of the best selling, most popular collections. These super authentic-looking designs are excellent for any occasion, and have been used extensively by professionals in the TV, film, entertainment and fashion industries. Our Temporary Tattoos seem genuine even in broad daylight, thanks to our secret ink formulas and state of the art printing techniques, as well as our unique Liquiskin® mat-e-fi-r®, a revolutionary shine remover that enhances realism instantly. We have an incredible range of ready to go Temporary Tattoos designs to choose from: Pirate, Fish, Fairy, Heart, Unicorn, Spider, Fairy, Cartoon Truck, Hearts, Yin and Yang, Anchor, Devil, Helicopter, Dog, Cat, Dolphin, Kangaroo, Koala, Roses, Cupids, Animals, Butterflies, Rose and Dagger, Rockabilly vintage Tattoos and unique artist designed temporary tattoos and of course many more. You can express yourself and design your own Temporary Tattoos or use them to promote your business. 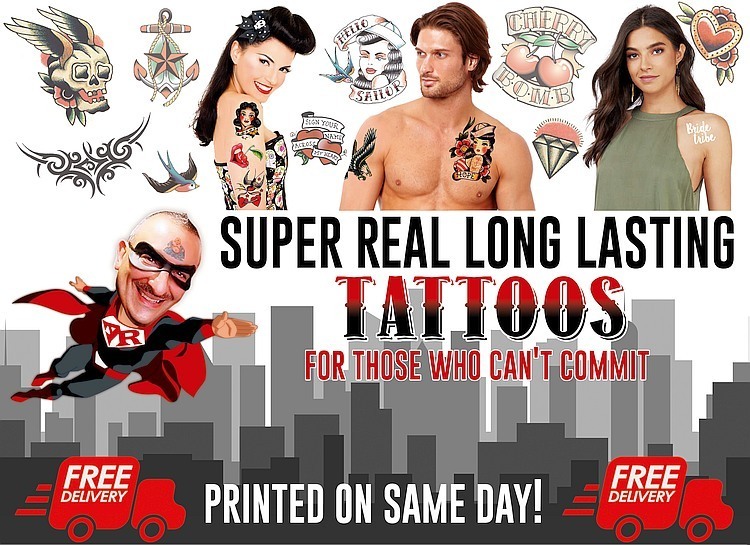 We have unique printing techniques on offer and a wide range of special FX products to make our Tattoos look better than even real ones. Do you know the great benefits of having your Business, Brand or Logo printed as a Temporary Tattoo for promotional purposes? Your Brand can be converted and printed fast into fabulous Logo Fake Temporary Tattoos, used for Sales Promotions and Conferences, School Fetes to raise money, Pass Outs for Nightclubs, Brand Awareness for Product Launches, Business Logos, Bands, School Emblems, Sponsorships, TV/Radio Stations, Fund Raisers, Charities, Flags, Sporting Club Logos, Trade Shows, All Special Events. Excellent for marketing against competitors. Have you ever thought that it would be really cool to make your own Temporary Henna Tattoos? Make your own Temporary Henna Tattoos for your childs next Birthday Party, create ID Temporary Tattoos so your kids won't get lost, create Tattoos that will enable you to trial, different designs to see which one you like the best. We have a great range of Temporary Tattoos designed for you to apply in a few seconds and make serious funds on the fete day. You can even purchase our DIY Temporary henna Tattoos Paper to make your own Temporary Tattoos. 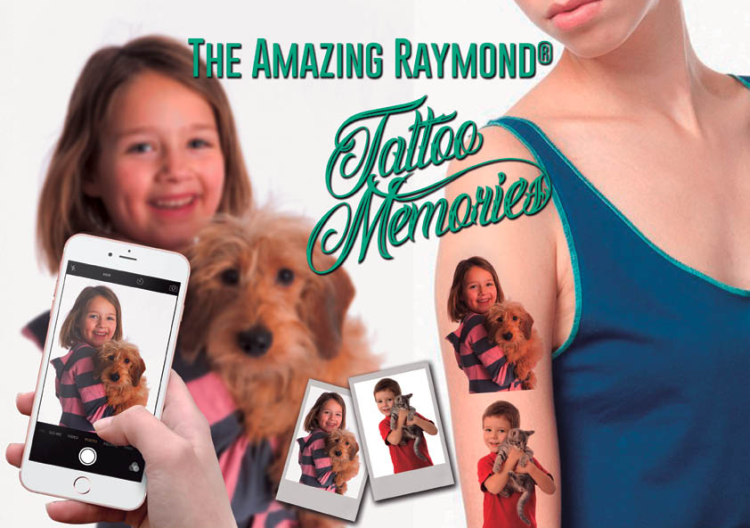 Quick and easy to transfer, The Amazing Raymond® temporary tattoos are a fun and playful resource for parties, celebrations and special events. Catering for a myriad of occasions, Fundraising, Special Day, Armbands, tattoos are true crowd-pleasers for all the family. And for a wild night out check out our hens and bucks or office party packs. Plus, if you can't find exactly what you want, you can try our personalised A4 Sheet: you submit your design, The Amazing Raymond® does the rest. Or you can go full DIY with our temporary tattoo paper to bring your own creations to life on a laser or inkjet home printer. 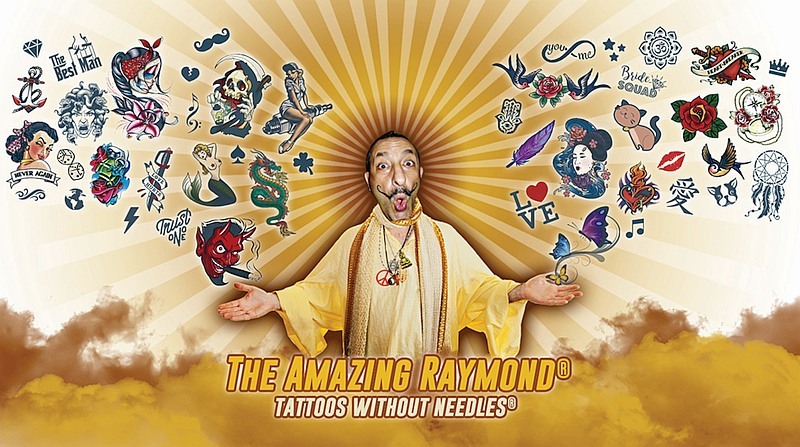 The Amazing Raymond® makes your tattoo wishes come true!